1.Fold down for use with eyeglasses and fold up for use without eyeglasses.They provide comfort and promote viewing ease. 1.Cover the lens for not use. 2.Use soft lintless cloth to wipe lens. 3.To remove any remaining dirt or smudges,add one or two drops of is opropyl alcohol to the cloth. 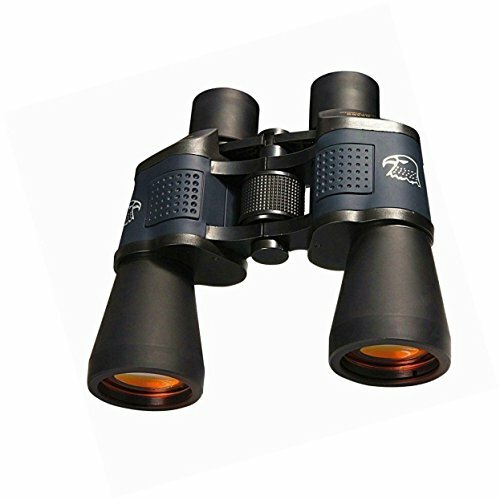 4.Suggest store binoculars at moisture-free place. Please do not look at the sun through a binocular. Waterproof and fogproof,it can use even under extremely severe condition,such as rainstorms and high humidity,on cloudy night it able to see clear as day. Comforat,Non-Slip Grip means you can watch birds,outdoor games or concerts for hours,without missing a single moment! Fully Multicoated(FMC) Optical Lenses.This feature guarantees superior light transmission and brightness. Up to 99.5% transmittance, it will take you to into a clear and bright world in which you can appreciate fantastic landscape. Great Gift,It is suitable for children,fathers and other relatives.Come with Hanging Strap,Backpack,Lens Cap and Eyepiece Cap,good protection of your telescope,easy to carry anywhere. Superior Service,100% money back guarnttee. If you are not 100% satisfied with our product,we offer a 30-day money back guarantee. If you have any questions about this product by GoECO, contact us by completing and submitting the form below. If you are looking for a specif part number, please include it with your message.